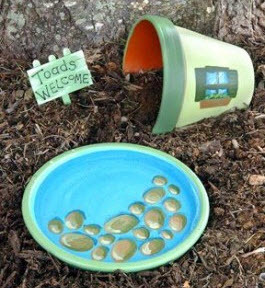 Create a suburban-style home for your toads! Get a small planter, lay it on its side, and paint it to look like a house. Dig a shallow hole, set the toad abode in the hole on its side with the entrance facing away from the wind if possible, and fill the hole back in. Get a large planter dish, paint the inside of the dish to look like a pool or pond, set the pool next to the house, and fill it with water. Cut a Popsicle stick in half, glue a whole Popsicle stick on the back of a piece of thin wood, and glue the Popsicle stick halves on either side of the whole stick to create a sign. Paint or decorate the sign, and put it near the house.